Heroin has become an extremely popular drug among young people in New Jersey. As a result, NJ law enforcement is starting to crack down on heroin crimes. Additionally, NJ prosecutors are not shying away from seeking the maximum allowable punishments in heroin distribution cases. Regardless of the reasons for your arrest, the fact is that you now need experienced legal counsel on your side. The criminal defense lawyers at the Tormey Law Firm know what it takes to beat your drug charges. We have handled numerous heroin possession and distribution cases in Essex County, including Belleville, Newark, and West Orange. Our experience in these cases is matched only by our impressive credentials. Travis J. Tormey, the firm’s founding partner, previously worked for two of the largest criminal defense firms in New Jersey and represented clients in drug distribution cases. Additionally, the firm’s drug crime defense team includes a former NJ prosecutor. This unique experience gives us a major edge in the courtroom and allows us to identify weaknesses in the prosecution’s case. If you are facing heroin distribution charges, the Tormey Law Firm can help you. Our lawyers will strive to achieve the best possible outcome to your case. Call us today at 201-654-3464. N.J.S.A. 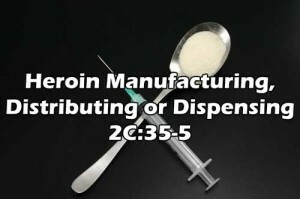 2C:35-5 prohibits an individual from knowingly manufacturing, distributing, or dispensing heroin anywhere in the State of New Jersey. The statute also applies to any adulterants, dilutants, or cutting agents. Do not make the mistake of thinking that you can only be charged with heroin possession. Although you might have been caught with a personal stash of heroin, you can still be charged with heroin distribution if law enforcement determines that you intended to manufacture, distribute, or dispense the drug at a later date. Additionally, if you are found in possession of more than 1/2 ounce, NJ prosecutors will presume that you intended to sell the drugs; this means that you will be charged with heroin distribution. Since heroin distribution charges are subject to sentencing under the Brimage Guidelines, these sentences often include mandatory minimums that cannot be lowered by the judge during the sentencing phase. In other words, if you are convicted of heroin distribution, you will probably be going to prison. If you are accused of selling heroin within 1,000 feet of school property, or near a public park, you face additional penalties. A conviction under N.J.S.A. 2C:35-7 can result in a minimum period of parole eligibility being attached to any prison sentence you receive. Additionally, you can be fined up to $150,000. A conviction for selling heroin to a minor or a pregnant woman can lead to enhanced penalties. Basically, NJ law allows the court to double the maximum penalties in these cases. In rare cases, you can actually be accused of being the Leader of a Drug Trafficking Network. It might be hard to believe, but all that is required for this charge is that you conspired with two or more other persons in a course of conduct to distribute, dispense, or transport heroin in New Jersey, while also serving as a financier, organizer, supervisor, or manager of at least one person. If other people were charged along with you, you could be looking at a sentence of 25 years to life in prison. The criminal defense attorneys at the Tormey Law Firm are prepared to fight your heroin distribution charges. We will aggressively represent you throughout the legal process and do what is necessary to keep you out of prison. Call us at 201-654-3464, or email us to schedule a free consultation at our office in Newark, NJ.